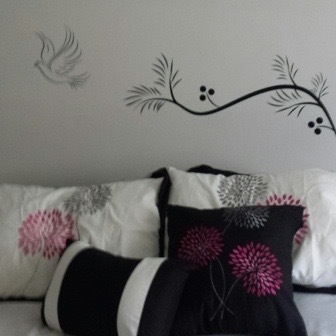 The Dove Trail Wall Decal can turn your plain room into something extraordinary in minutes! 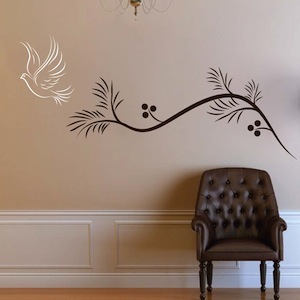 Why waste time, money, and energy with painting when the Dove Trail Wall Decal has saved you all of that trouble? Decals have many options for orientation that give you the flexibility to change and reposition to your taste if necessary. Try to get a painter to do that! 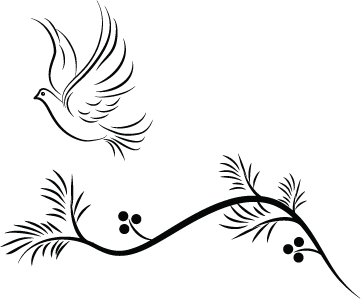 To get multiple color arrangements, place multiple orders of the same Dove Trail Wall Decal in the colors/sizes of your choice and really mix it up! 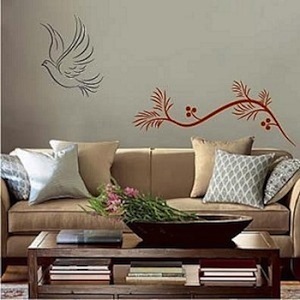 The Dove Trail Wall Decal is made from 100% interior safe, removable vinyl that appears painted right on the walls! Perfect for permanent or temporary decorating! All wall decals are available in multiple sizes and over 40 different colors. Please note: The plain, black and white, image below the product image is the actual design you will receive with each order in the color and size of your choice. Specify the desired orientation when applicable. Design sizes within a close approximation. This decal went on easily and looks great! I have a large plain wall in my bedroom and it added just what I needed to the decor. I love my decal it look amazing, I received many compliments, thank you can't say enough about how beautiful it looks. loved the vine and was easy to install but ordered dove in linen and could not see on gray wall. So could not use dove.